The belief that "good triumphs over evil" resonates deeply in our psyche through religious, cultural, and political discourses. It is also a common theme in the entertainment media where the struggle between good and evil is frequently resolved through violence. The potential negative impact of media violence on children has long been a public concern. It is even more troubling when U.S. military violence, both in the news and in the entertainment, is often glorified as heroic and patriotic. 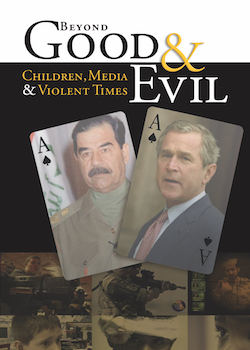 This video examines how the "good and evil" rhetoric, in both the entertainment and the news media, has helped children to dehumanize the enemies, justify their killing and treat the suffering of innocent civilians as necessary sacrifice. Featuring commentary from media scholars (Robert Jensen, Robin Andersen), child psychologists (Diane Levin, Nancy Carlsson-Paige), teachers (Merrie Najimy, Brian Wright), educators (Eli Newberger and Betty Burkes), and children. "Beyond Good & Evil: Children, Media & Violent Times is a truthful and shocking look at how mass communication distorts and manipulates language and visual imagery. The video is a perfect tool in educating students for critical literacy, in aiding students to see the who benefits from stories reported in the news and shown in movies. Beyond Good & Evil graphically shows students how the media's overriding objective of satisfying an audience converts real issues surrounding race, war, and violence into nothing more than show business." "Beyond Good and Evil highlights the failure of government and our most powerful media corporations either to protect children from the harm of real and virtual violence or to foster thoughtful, ethical responses to complex social and political issues. The pure-hearted reactions of the children in this film to the horrors of war are moving, while the simplistic thinking of many of the adults is appalling." "At a time when educators across the US are dealing with how to complicate young people's thinking around the various world issues we as a country are involved in, here is a superb tool for teachers to explore these issues from a deeper perspective than I have ever seen. A wonderful staff development tool to discuss these issues as a staff and get a lively discussion going around some difficult to talk about topics." "How do simplistic good versus evil and us versus them messages influence US culture and policy-making, from classrooms to media to the highest levels of government? This MEF film explores this question."